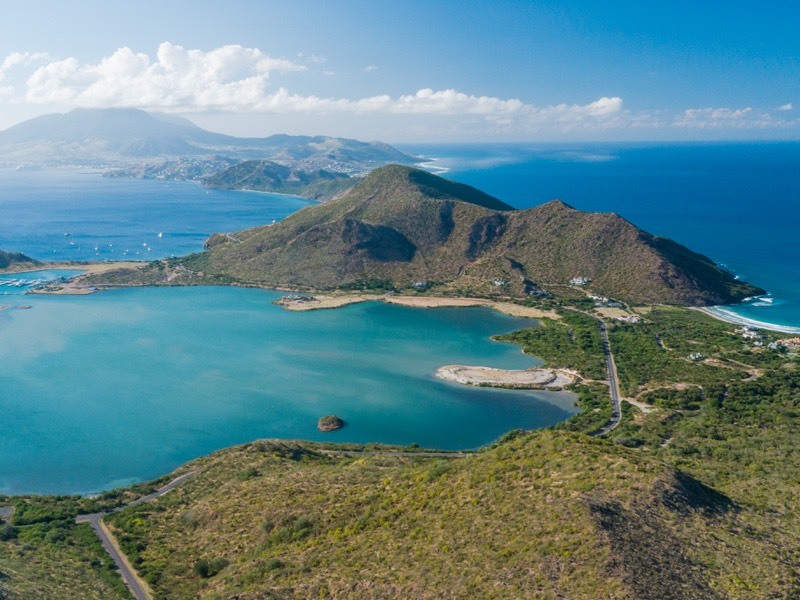 Some people believe they could spend a lifetime exploring St. Kitts – and who are we to disagree? 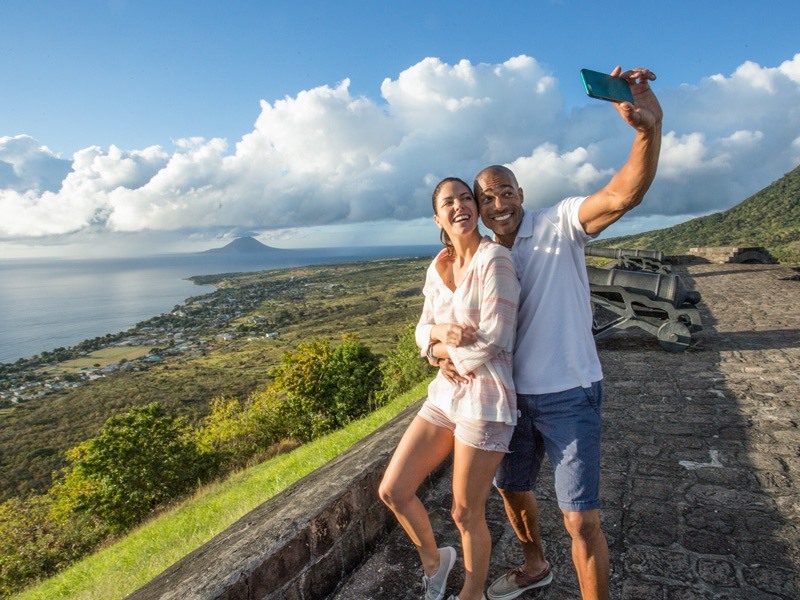 But whether you have a week, a weekend or just a day to get to know our beautiful island, be sure to see what makes St. Kitts a destination unlike any other. 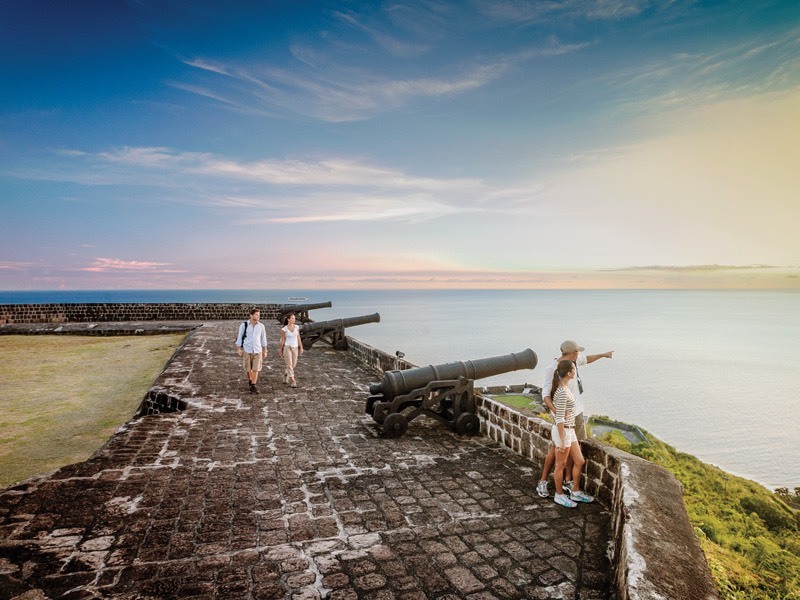 From a seaside fortress dating back to the 1690s to a ride on the rails of St. Kitts' historic sugar train, get set for an experience that could only happen here. And now there are more ways to get here than ever before. 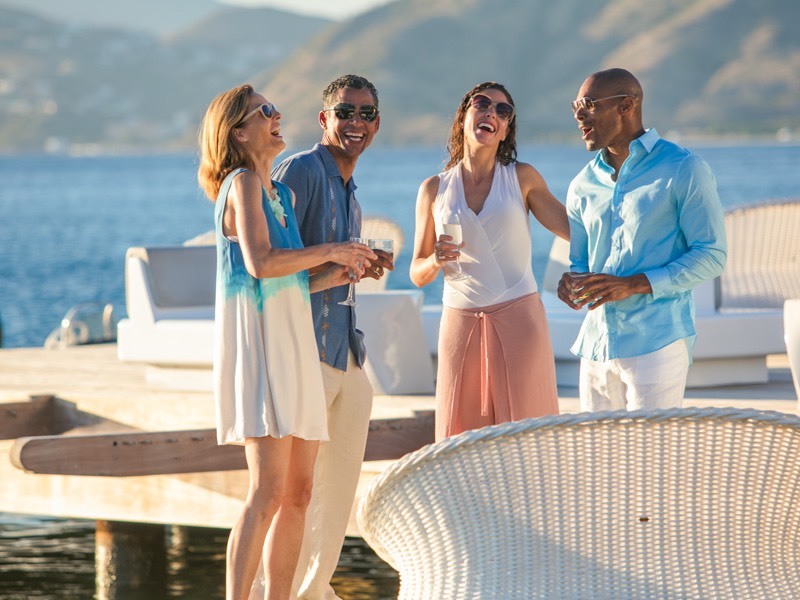 Click here to see the airlines and cruise ships currently serving St. Kitts - and to find out more about United Airlines®' new, second weekly nonstop flight from Newark to St. Kitts on Wednesdays beginning soon. While you could spend all day lulling on St. Kitts’ golden beaches, there’s much, much more to do in this tropical paradise. 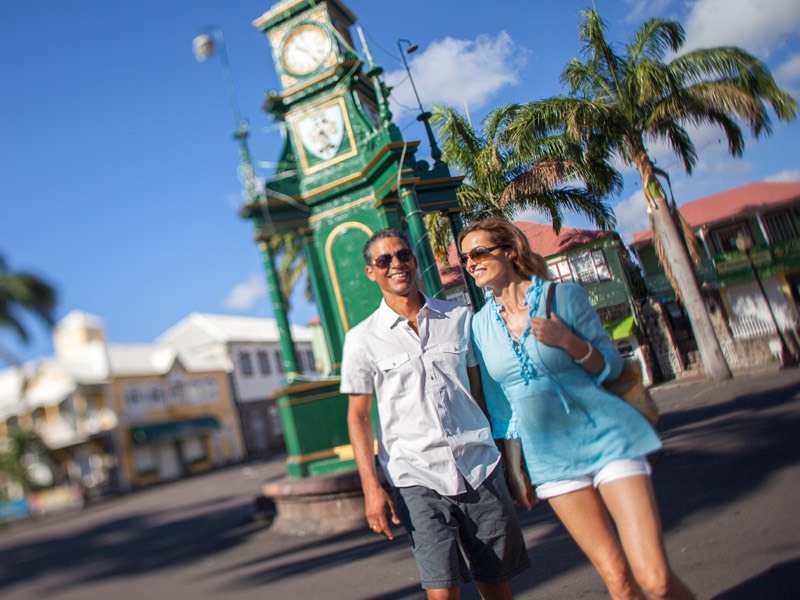 This one-day itinerary, ideal for cruise ship passengers disembarking at Basseterre, takes in the island’s historic sights and scenic landscapes. 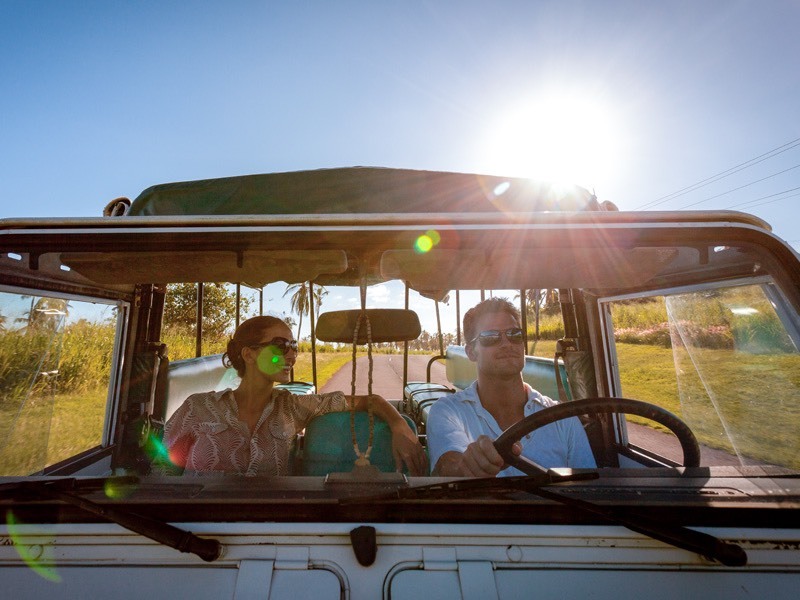 Rent a car or hire a taxi and discover some of the best Caribbean vacation spots, with a few breaks for farm-to-table Caribbean cuisine. 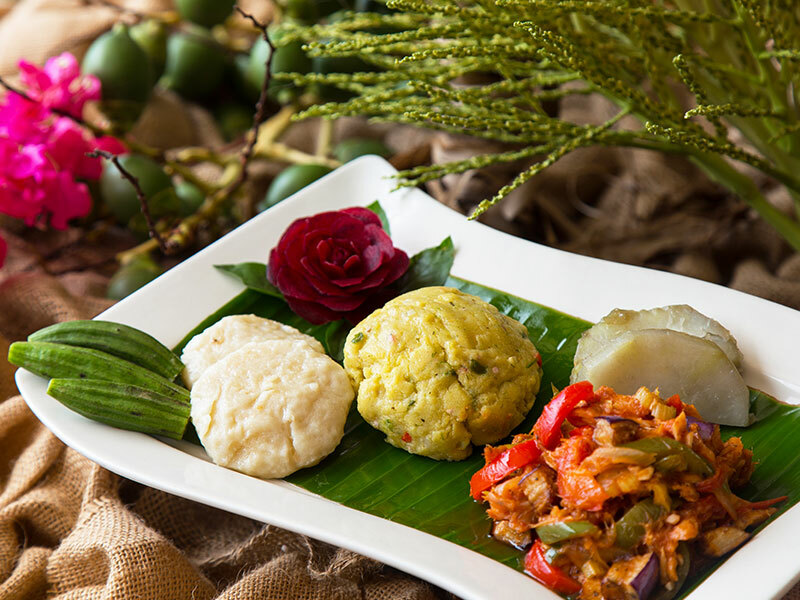 Kick start your day with a traditional Kittitian Breakfast salted codfish and Johnny cakes at The Verandah. The Ocean Terrace Inn’s new restaurant featuring seating indoors and on a breezy wrap-around terrace with panoramic views of Basseterre Bay. Filled with gingerbread-trimmed pastel cottages, Basseterre is a friendly, laid-back town ideal for a morning stroll. 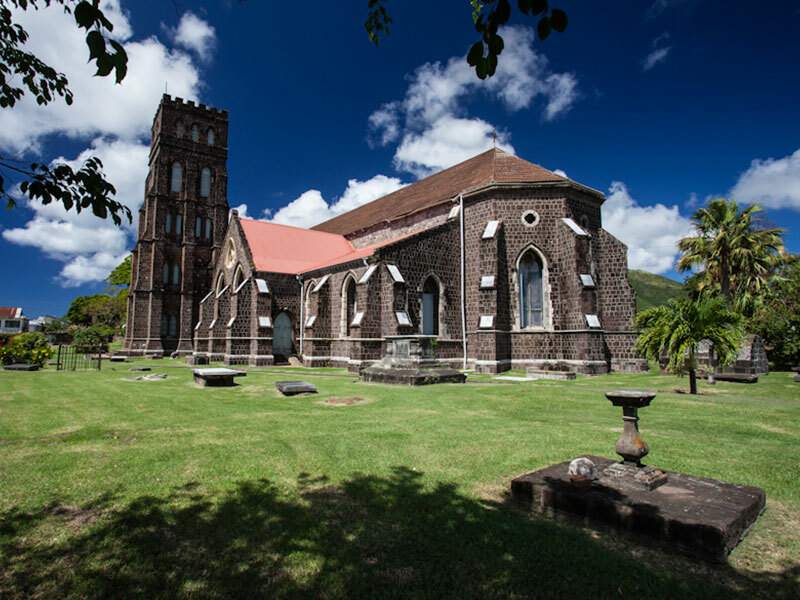 Be sure to stop by St. George’s Anglican Church, Independence Square, and the National Museum. Amble along the southern coast to Old Road Town. Just inland await the 17th-century ruins of a sugar mill at the historic Wingfield Estate; the flower-filled gardens of Romney Manor; and the Caribelle Batik Store, where artisans hand-print fabrics using 2,500-year-old techniques from Indonesia. Continue west along the coastal road through picturesque villages. You can’t miss the towering bulk of Brimstone Hill Fortress National Park along the way, a UNESCO World Heritage Site. Dating from the 1690s, it provides an important look into the island’s colonial past. Be sure to pick up an audio guide and map at the entrance. Learn how ship captain John Newton came to write the beloved folk song “Amazing Grace”—and how it relates to St. Kitts—at the Amazing Grace Experience at Sandy Point. Head to the foothills of Mt. Luimiaga to Belle Mont Farm, a leading sustainable hotel set on a 400-acre organic farm. Sip on exotic cocktails made with farm fresh fruit and herbs at The Mill Bar, or dine on a late lunch of farm-to-table Caribbean-inspired cuisine at The Kitchen. 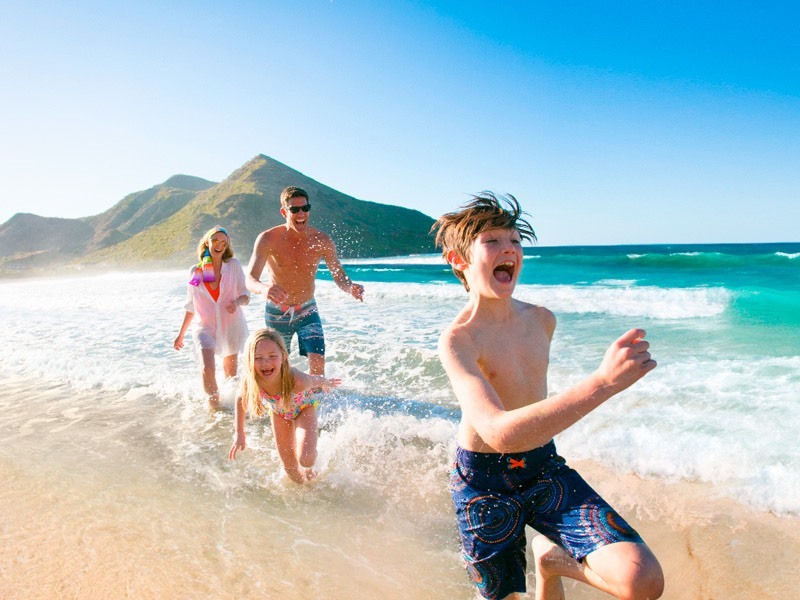 Be apart of the beach action of South Frigate Bay Beach. 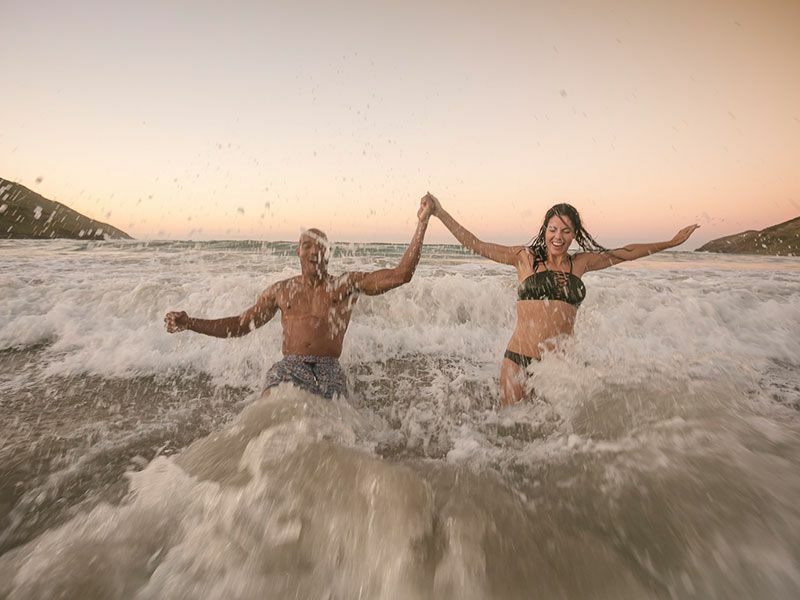 Splash in the surf, go for a sunset stroll along the one-mile stretch of white sand or follow the sound of Carribbean rhythm to the many island bars that serve drinks, food, craft, and trinkets. Sit down for Caribbean bouillabaisse at Serendipity or the grilled fished in coconut sauce at the beautiful Palm Court, both in Fortlands, Basseterre, offering breathtaking views over the harbor. 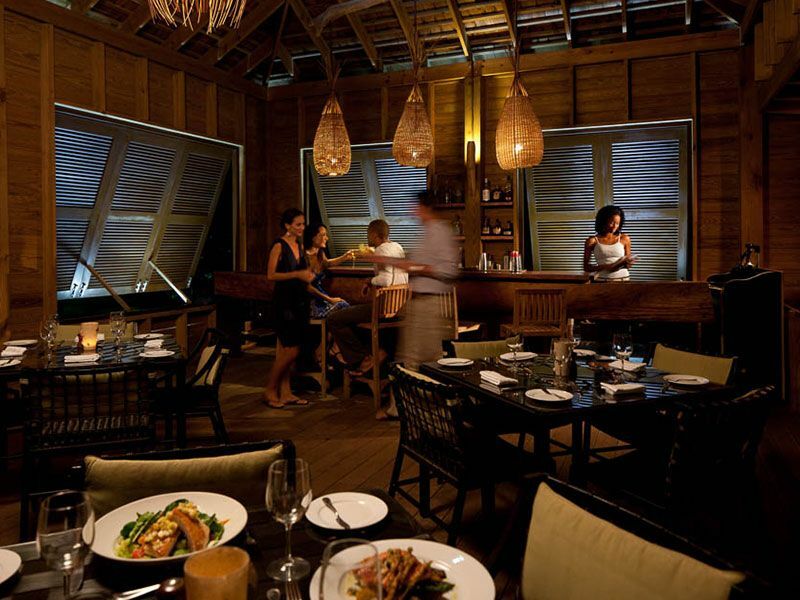 Or if you plan to make an evening of it at Frigate Bay, there are plenty of restaurant options here as well. 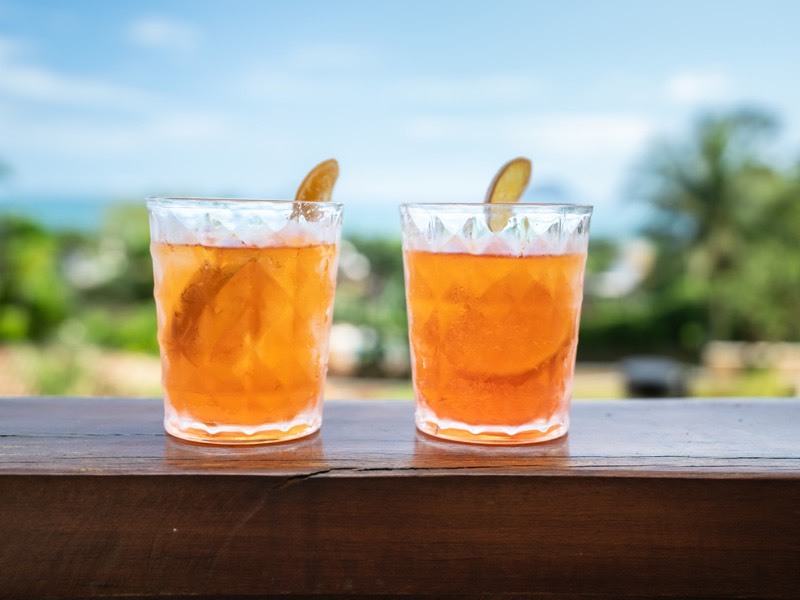 ï¿½Enjoy rum punch and dance the night away to a live DJ or band at the many buzzing, spirited beachside bars along The Strip in Frigate Bay. 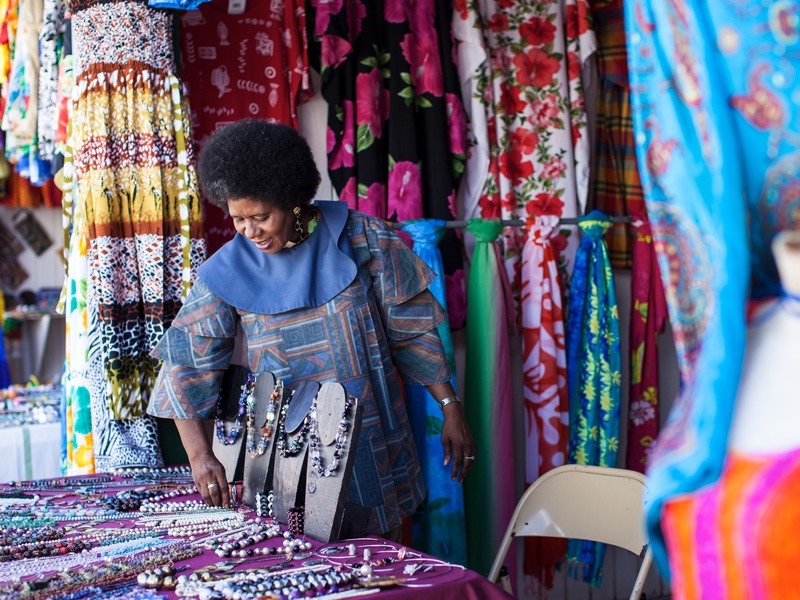 Three days is the perfect amount of time to sample everything St. Kitts has to offer—history, gorgeous scenery, scenic train rides, duty-free shopping, some of the best beaches in the world, and plenty of lounging opportunities. You’ll need to rent a car or hire a taxi for this itinerary, which assumes you’re based in Basseterre. Be sure to toss the snorkeling gear into the trunk. Kittitian flavors kick start your morning! 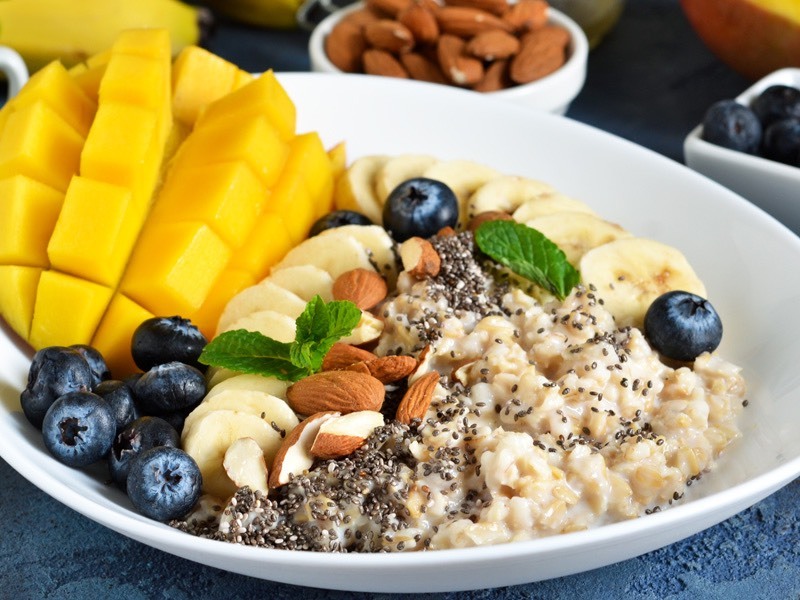 Savor a traditional English breakfast or a traditional Kittitian Breakfast salted codfish and Johnny cakes at the Verandah, the new restaurant at Ocean Terrace Inn. 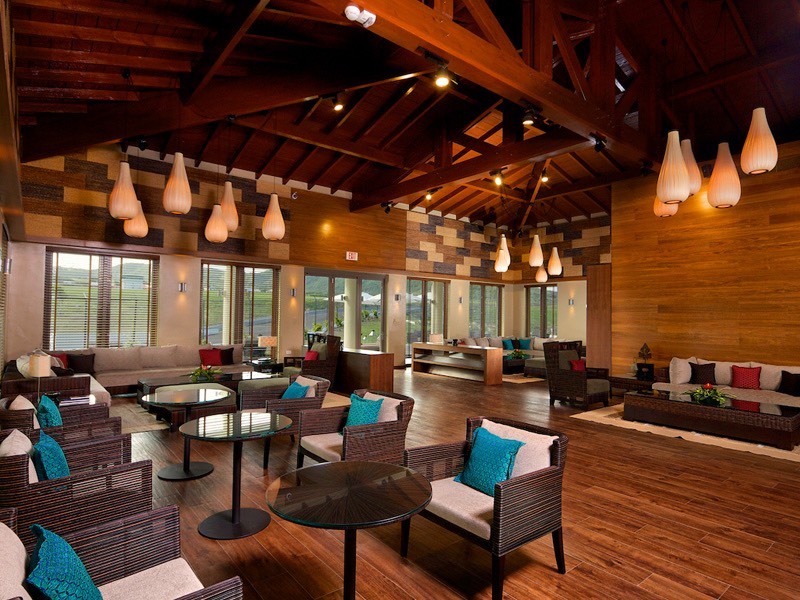 Score a seat on the wrap-around terrace for panoramic views of Basseterre Bay. Filled with gingerbread-trimmed pastel cottages, Basseterre is a friendly, laid-back town ideal for a morning stroll. Be sure to stop by St. George’s Anglican Church, Independence Square, and the National Museum and the Rosie Cameron Art Gallery. Continue west along the coastal road through picturesque villages dotting the rumpled green, palm-tree-shaded landscape. You can’t miss the towering bulk of Brimstone Hill Fortress National Park along the way, a UNESCO World Heritage site. Dating from the 1690s, it provides an important look into the island’s colonial past. Be sure to pick up an audio guide and map at the entrance. 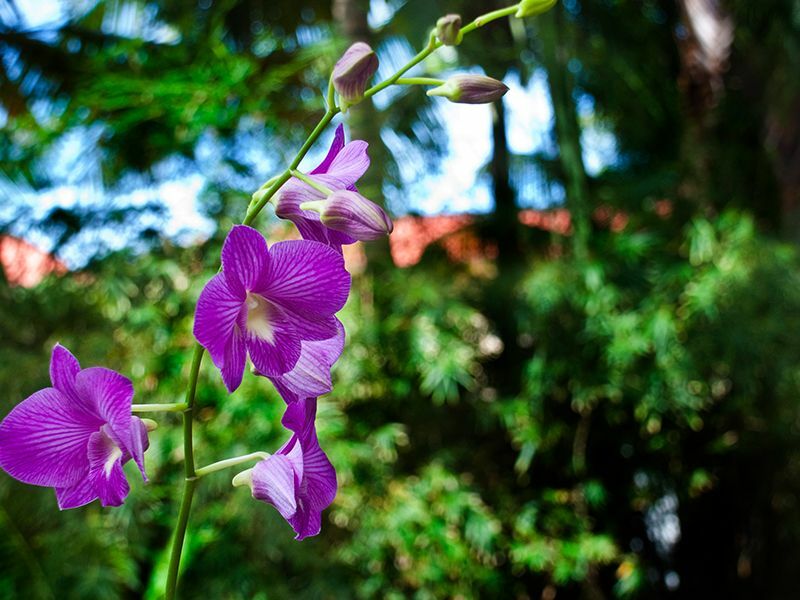 Admire orchids of every stripe and color at St. Kitts Eco Park, a fascinating agro-tourism demonstration farm. Then scale the watchtower for stunning views out over the sparkling Caribbean Sea. Continue driving along the coast, around the island’s northern end, stopping for picture-taking or a quick snorkel at a secluded beach. Stop for a home-cooked lunch at one of the seemingly nondescript shacks. Locals very likely will point you to Cooper’s Bar/Glenda’s Place in Dieppe Bay Town, where a blackboard advertises daily specials—conch water (soup), BBQ ribs, fried local fish, stewed mutton … not to mention the Caribbean-flavored sides. Round out a busy day with a beachfront natural aloe rub as the red sun drops into the sea and the sky turns tangerine orange and magenta before your eyes. There’s nothing like tucking into freshly caught lobster grilled right on the beach, to a background track of crashing surf and local rhythms. Try Sprat Net in Old Town Road or one of the many beach restaurants in Frigate Bay. 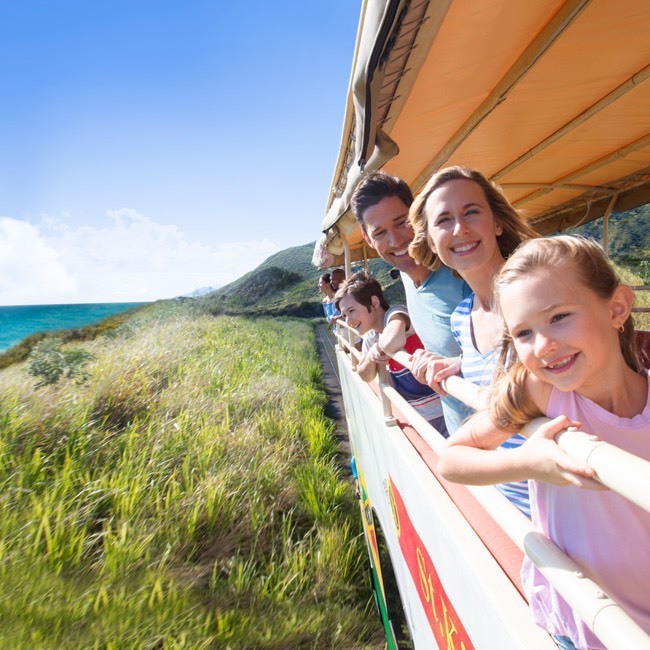 Hop aboard the St. Kitts Scenic Railway, a narrow-gauge train that once transported sugarcane on the island. 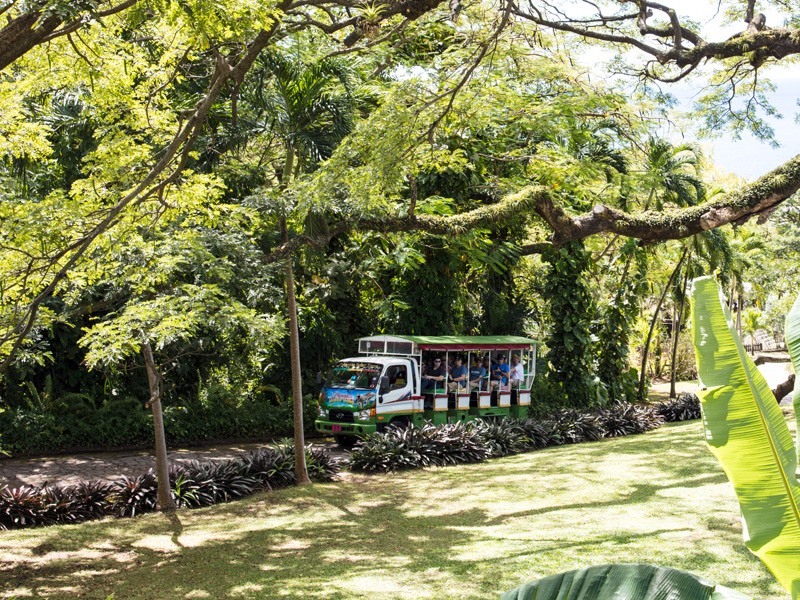 As you make a four-hour circuit around the island, admiring stunning views around every turn, the conductor relates stories about the island’s sugarcane history, local folklore, and island geography. A string of beaches sprinkles the southeast peninsula, with Cockleshell Beach being one of the most popular. Spend a leisurely afternoon body surfing, lying out on the sugar-white sand, and enjoying local food from one of the rustic beach bars. Give a toast to the sun with a signature craft cocktail at this Christophe Harbour bar overlooking the sparkling sea. Round out the day with a romantic dinner along the island’s southeast peninsula. 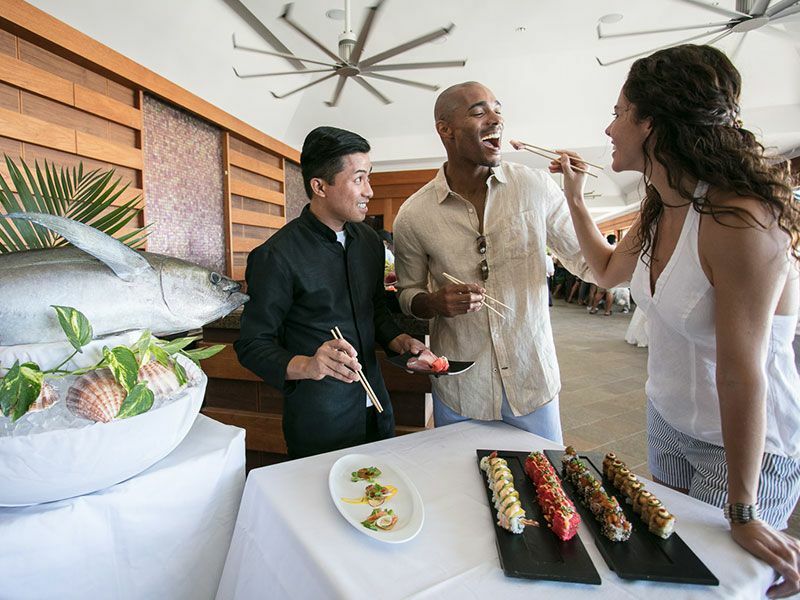 Spice Mill, capitalizing on the island’s multiethnic traditions with the freshest of local ingredients, is on Cockleshell Bay; and swank Carambola Beach Club, showcasing a sushi bar, eat-in wine cellar, and fiber-optic fountains, is on South Friars Bay. Saddle up for a canter along the beach or through lush, tropical rain forest and sugarcane fields. Visit Trinity Inn Stables or have Pereira Tours organize a tour for you. 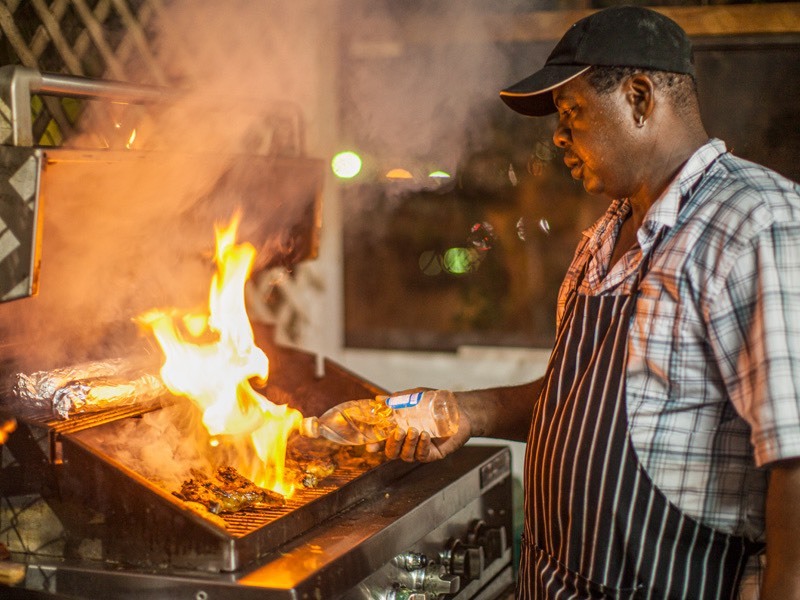 There are plenty of local restaurants in downtown Basseterre that offer delicious local fare. 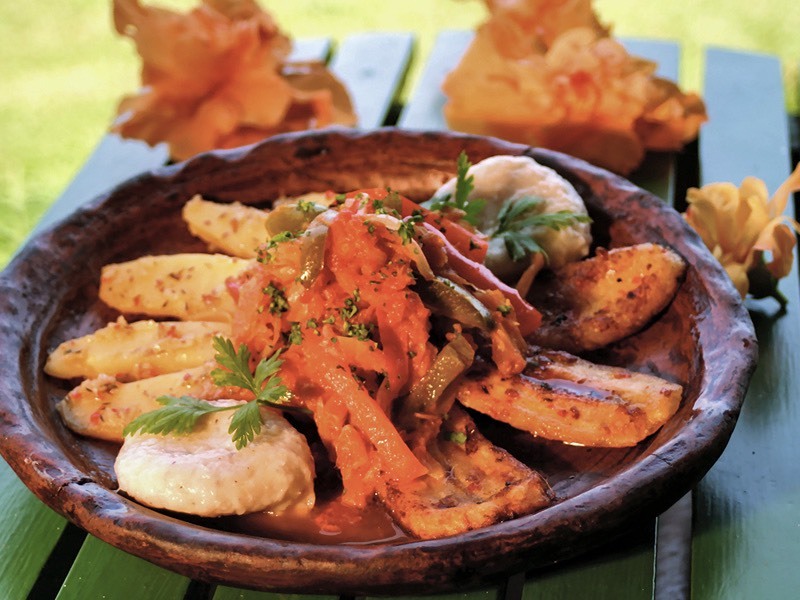 Serendipity restaurant in Fortlands, Basseterre, offers the Caribbean’s best bouillabaisse, topped off with spectacular views over the harbour. Breezy Ballahoo and El Freddo's in the city’s historic heart whips up island favorites including conch chowder, fresh local fish and spiny lobster salad. 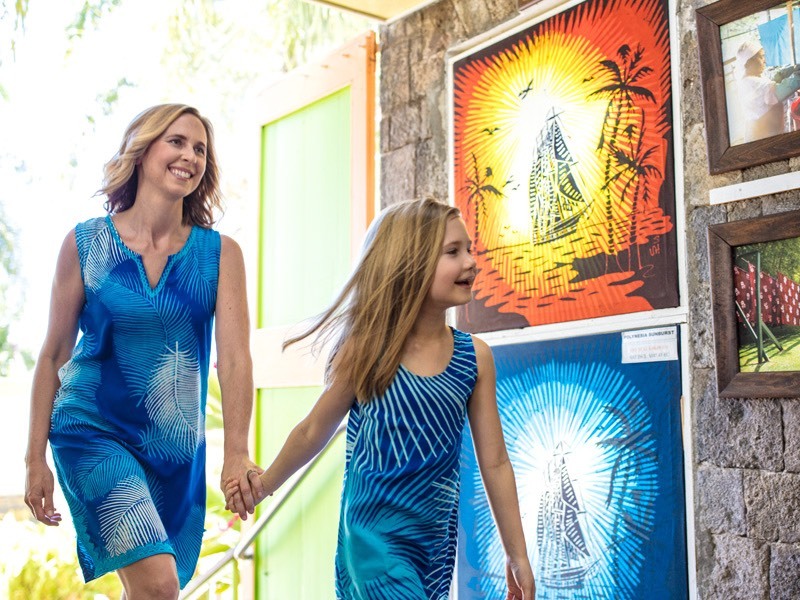 Poke into Basseterre’s charming shops on a stroll around town, the perfect place to find souvenirs for friends and family back home. And don’t forget to visit Port Zante with its wealth of duty-free shopping and the Amina Craft Market, showcasing a variety of pottery, accessories and paintings by local artisans. 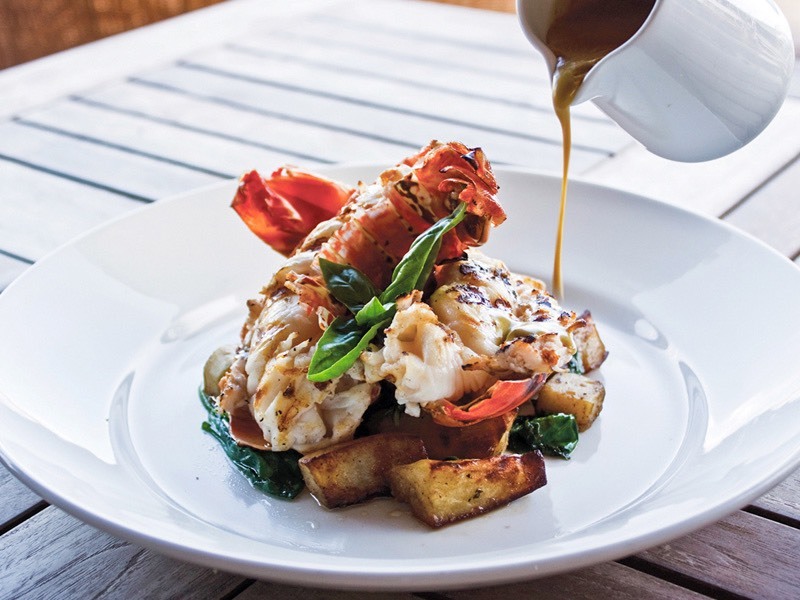 Basseterre and Frigate Bay have a bevy of international restaurants—whether you’re in the mood for Italian, French, Japanese, Indian, or Asian, you’re in luck. ï¿½Drink rum punch and dance into the wee hours of the night at any of the Frigate Bay Strip’s buzzing beach bars. Four days is the ideal getaway to pack in plenty of family fun. 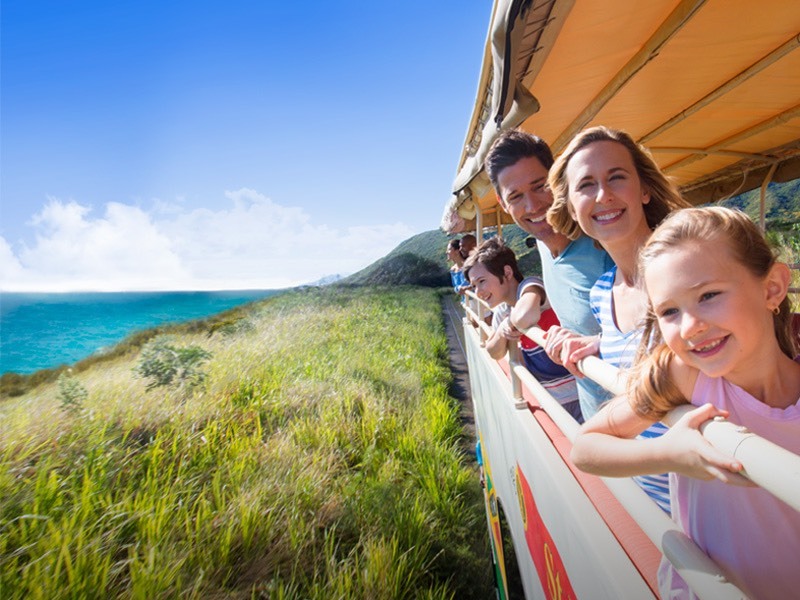 Explore the rainforests and experience the island’s natural beauty aboard the Scenic Railway Train. 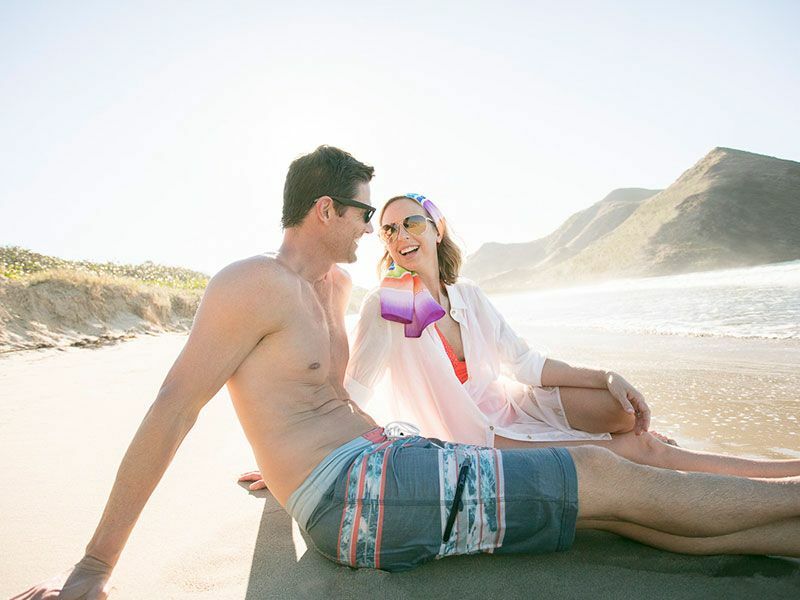 Enjoy plenty of laid-back beach time, a chance to snorkel the reefs, and even time for Dad to get some fishing in. Wake up early to a Caribbean-flavored breakfast at your hotel. Kick start your family adventure with a breathtaking zip-line tour through lush rainforests with Sky Safari Tours, ideal for children aged six and up. Keep a lookout for resident vervet monkeys in the trees. 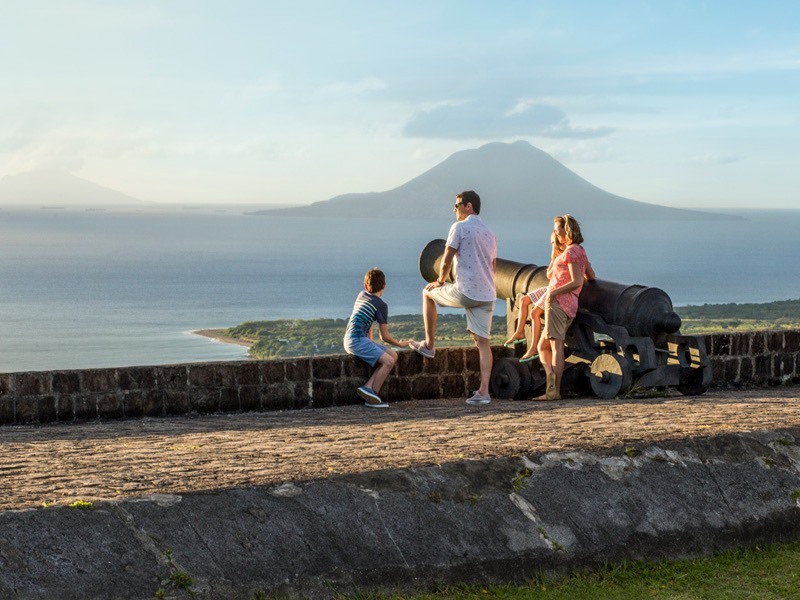 Visit the Brimstone Hill Fortress National Park, offering a magnificent vantage of St. Kitts, and a fascinating historical site to explore. Head to South Friar Beach for some much-deserved beach time fun. Enjoy a sumptuous kid-friendly lunch at Carambola Beach Club, unwind on the beach and swim in the calm turquoise waters. Enjoy sunset cocktails at one of the cafes or bars along the beach at South Friars Bay. You’ll know you’re on island time, as you soak up the infectious Caribbean rhythm. 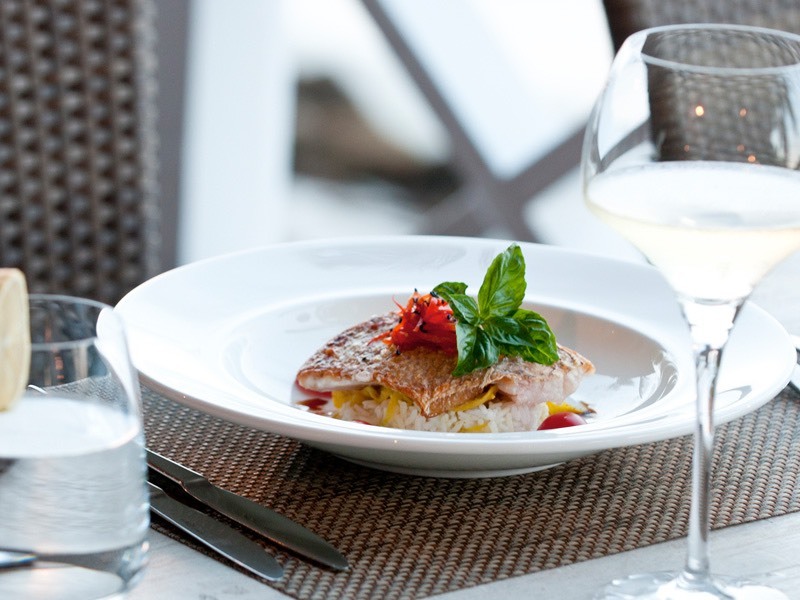 Enjoy a sumptuous dinner at one of our fine dining establishments such as Marshalls in Frigate Bay. Serving Caribbean cuisine with oceanviews overlooking neighboring Nevis, it will not disappoint for your first dinner on island. Get an early start and fuel up with fresh coffee and pastry at one of the many coffee shops on the circus in Basseterre. 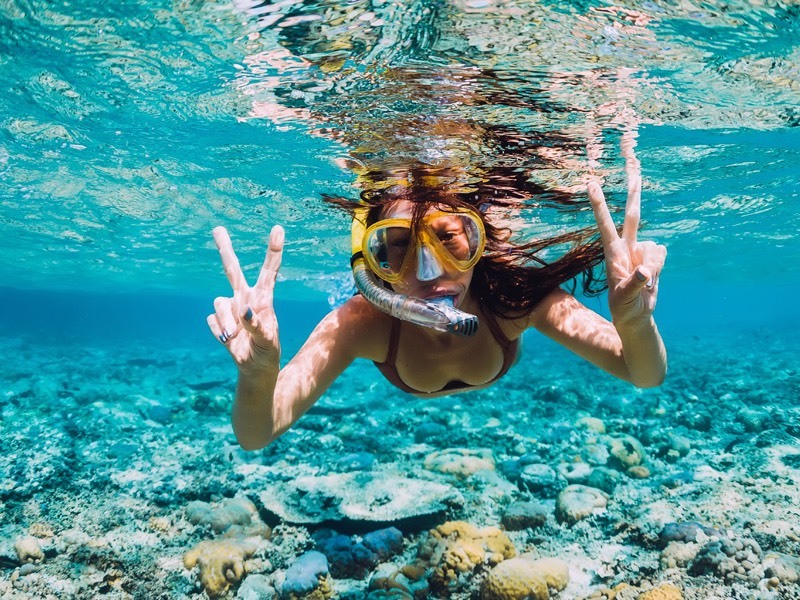 Stock up on sunscreen, hats and waterproof cameras for the morning’s ocean voyage. 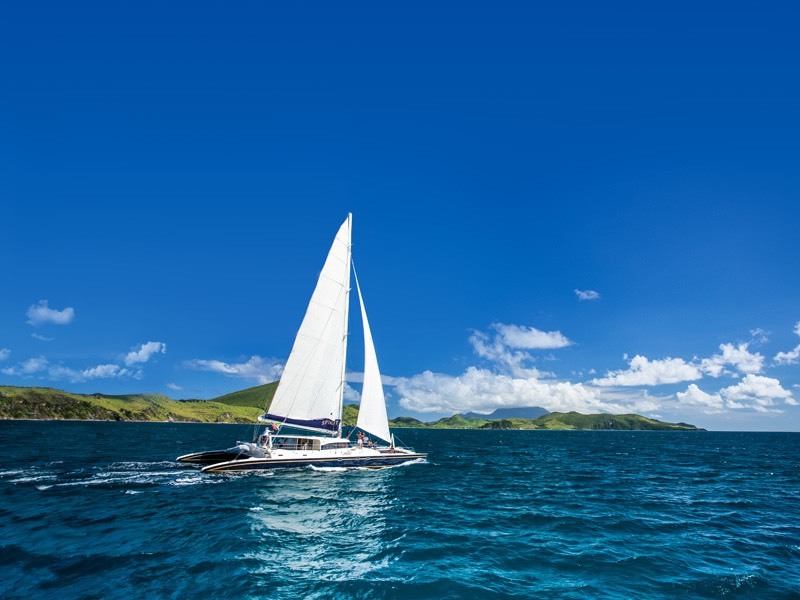 Embark on an exciting catamaran sail and explore St. Kitts finest snorkeling sites. 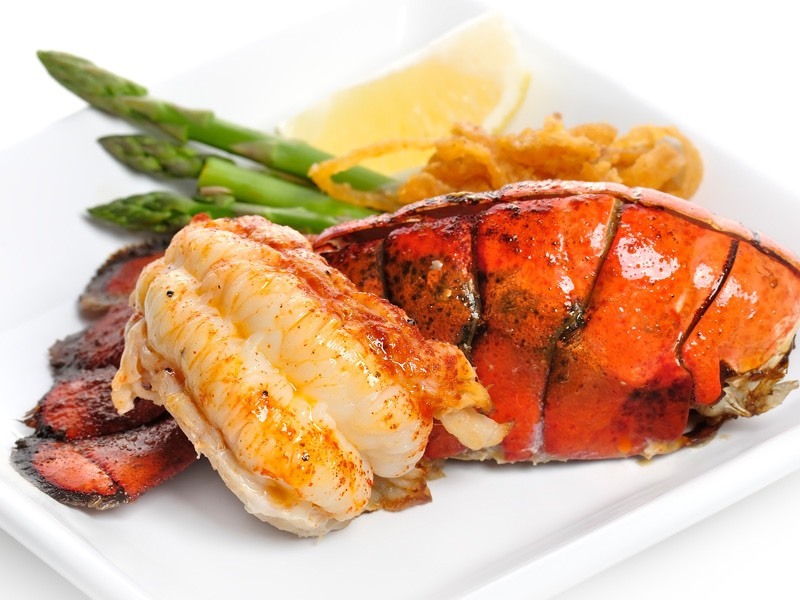 Enjoy a buffet lunch onboard, prepared by a friendly local crew. Head to your hotel and relax or go beach fishing at the black sand beach of Dieppe Bay. This exotic beach is protected by a reef also offering great bathing and snorkeling. 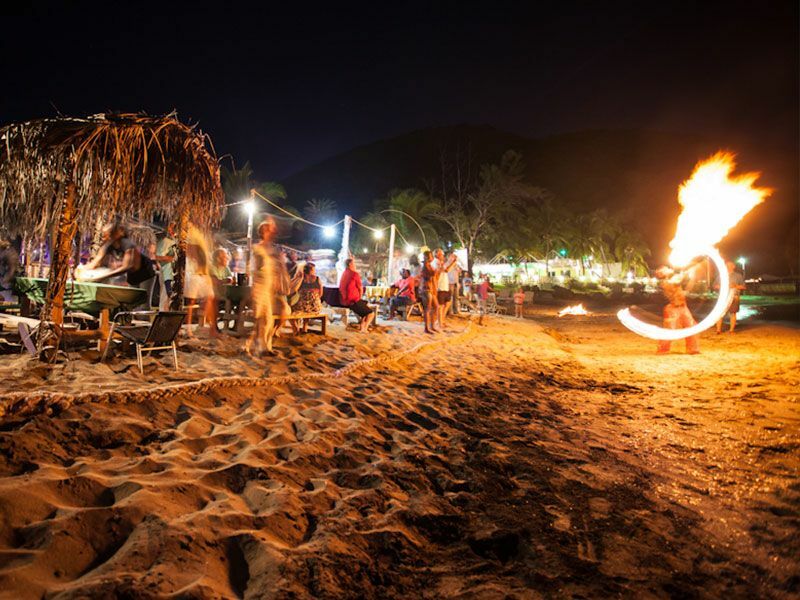 ï¿½Go early and enjoy a lively family-friendly beach bonfire at Mr X’s Shiggidy Shack Bar & Grill along The Strip at Frigate Bay. There’s fire dancing on Thursdays and live music on Friday nights. St Kitts Scenic Railway Tour is a unique way to see the island and its friendly Kittitians. A great experience for older kids to learn about the island on a scenic meander along the coastline. Enjoy lunch in downtown historic Basseterre at one of the many fine restaurants overlooking the circus. Try the bustling Ballahoo, offering Caribbean favorites of coconut curried shrimp, conch chowder and will cook your favorite whole fish just the way you like it. Enjoy quality beach time on the quiet and secluded Cockleshell Bay. 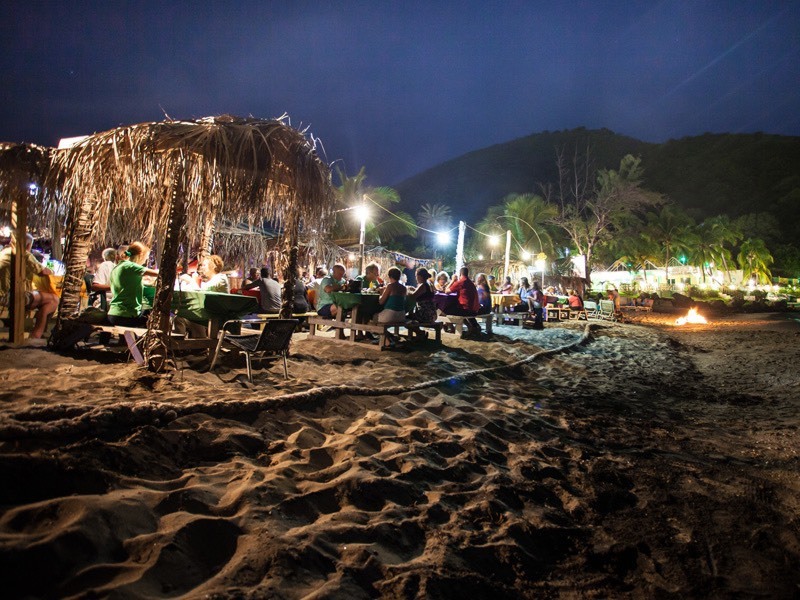 Watch the sunset over cocktails at a beach bar and enjoy fresh seafood and authentic local flavors, whether you’re in the mood for a reggae style beach barbecue or fine dining. Watch Batik being made at Caribelle Batik on the beautifully landscaped Romney Manor. Shop for a unique hand-dyed artwork and take a short lesson to try your hand at this one-of-a-kind process. 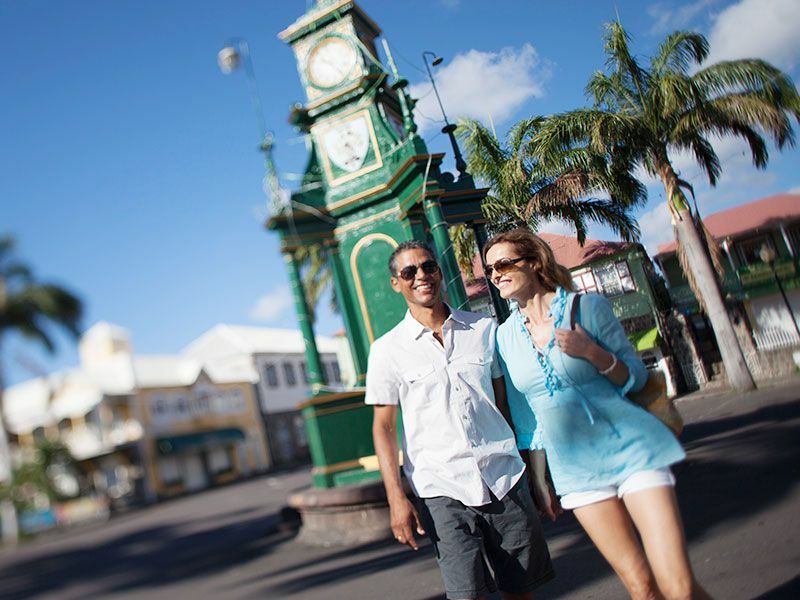 Stroll around the historic capital while shopping for souvenirs in downtown Basseterre and don’t forget to venture to Port Zante for duty-free shopping. Lunch on the breezy Verandah at Lemon Grass in Basseterre. 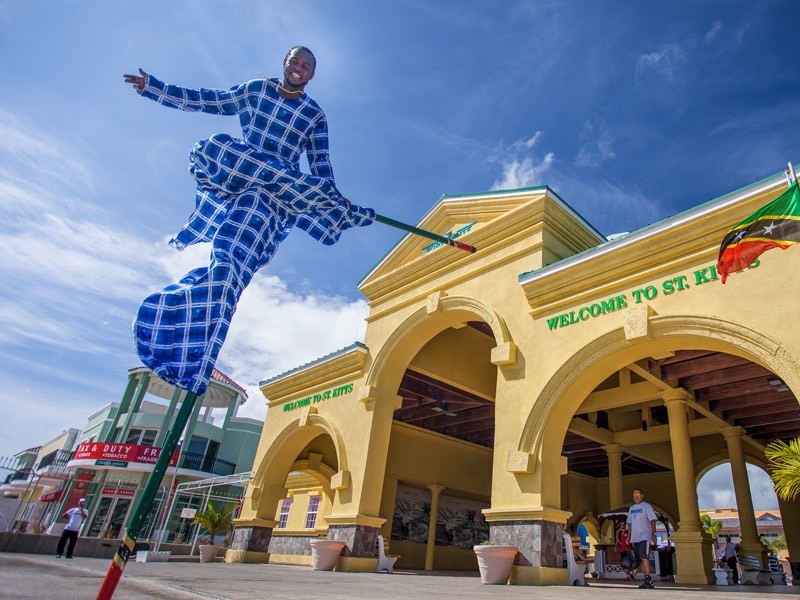 Steal a final glimpse of St. Kitts' beguiling beauty, bid new friends a fond farewell and keep the smiling faces you encountered on your heart as you head to the Robert Llewellyn Bradshaw International Airport (SKB) to depart the island. Travel safely, until we see you again! 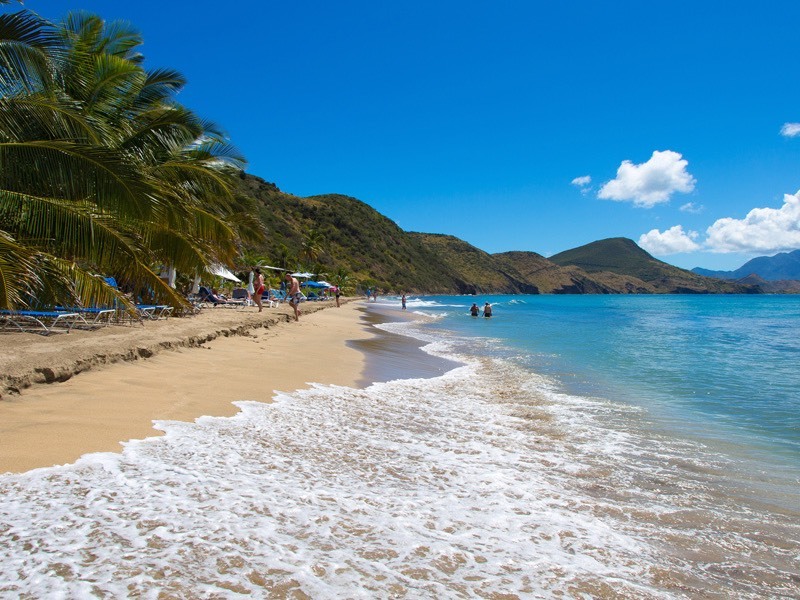 If you’re fortunate enough to have a week on St. Kitts, you’ll be able to delve deeper into the island paradise’s offerings, including a trip through a tropical rainforest and a visit to our sister island of Nevis. You’ll need to rent a car or engage the services of one of our knowledgeable Taxi Operators for this itinerary, which assumes you’re based in Basseterre or on the outskirts. Be sure to throw your snorkeling gear into the trunk. Amble along the southern coast to Old Road Town, the first British settlement in the Caribbean. Just inland await the 17th-century ruins of a sugar mill at the historic Wingfield Estate (if you have extra time, go ziplining through the luxuriant rain forest here); the flower-filled gardens of Romney Manor; and the Caribelle Batik Store, where artisans hand-print fabrics using 2,500-year-old techniques from Indonesia. Continue driving along the coast, around the island’s northern end, pausing for picture-taking or a quick snorkel at a secluded beach. Stop at one of the local huts for a home-cooked, local lunch. Round out a busy day with a relaxing massage at one of our relaxing spas. 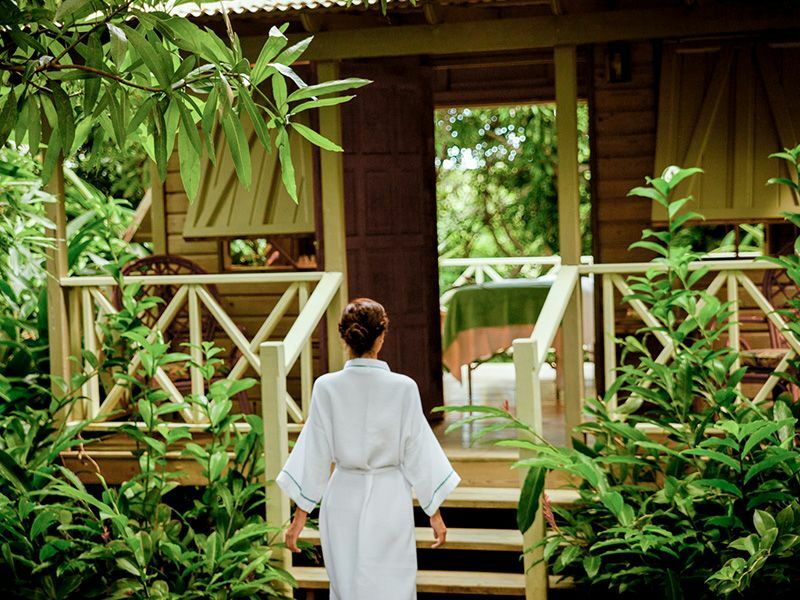 Soothing bamboo treatments are an island specialty. There’s nothing like tucking into freshly caught lobster grilled right on the beach, to a background track of crashing surf and local rhythms. Try Sprat Net in Old Town Road or Mr. X’s Shiggidy Shack in Frigate Bay. 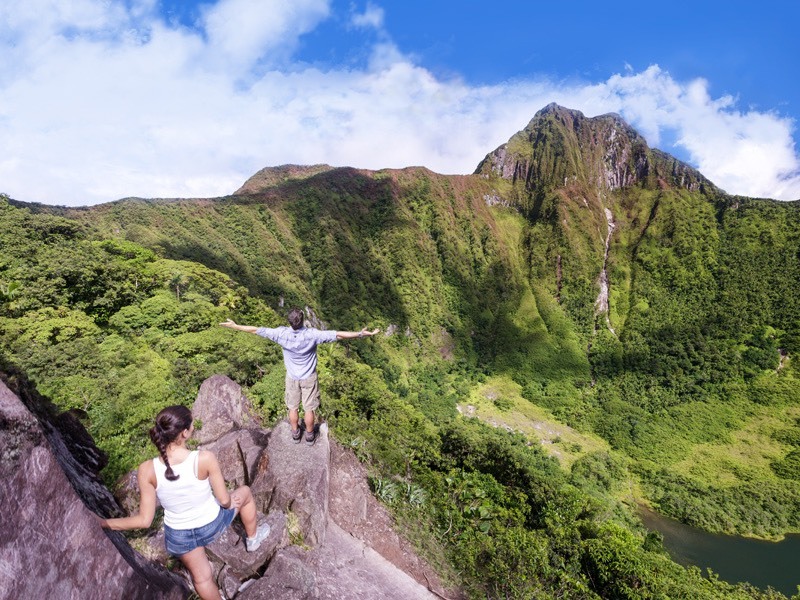 The dormant volcano Mount Liamuiga provides a lovely hike to its summit. You’ll pass through lush, tropical rain forest and beneath misty layers of cloud forest. At the top, admire far-reaching views of the Caribbean island paradise. Be sure to book a guide for the climb. Soak your sore muscles in the blue waters of Cockleshell Beach on the South East Peninsula. 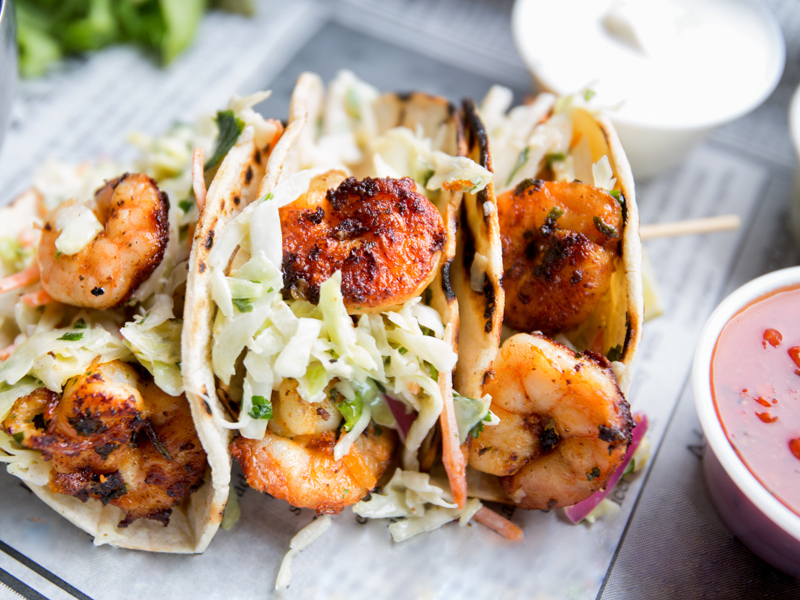 Stop for fresh grilled fish and coconut shrimp salad at Reggae Beach Bar & Grill or spend the afternoon on the sand at Spice Mill Restaurantï¿½ sipping on signature island cocktails or indulge in the savory flavors of the seafood soup. Head to Wingfield Estate to experience our lush tropical rainforests from a thrilling new perspective. 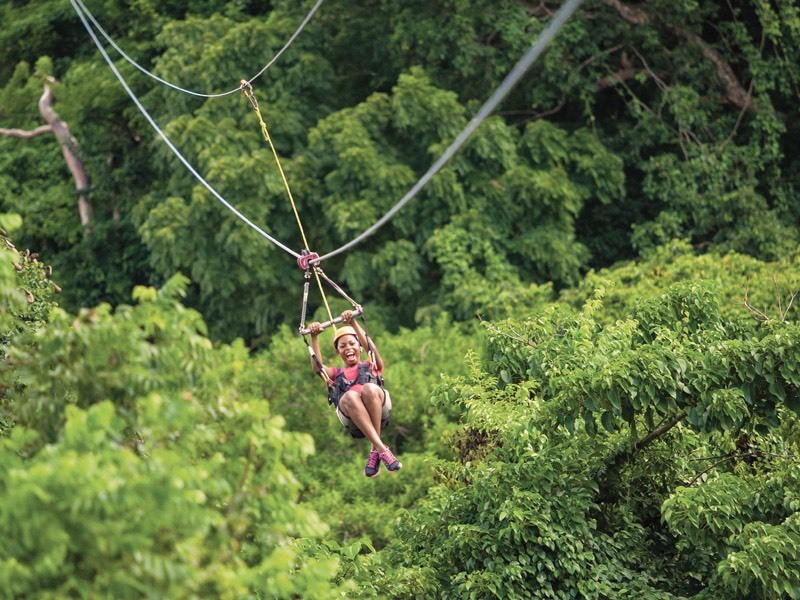 With Sky Safari Tours you’ll ride in a comfortable harness reaching speeds of up to 80 km an hour on 5 cable lines as you race atop St. Kitts’ spectacular rainforest. ï¿½After a busy morning of ziplining and exploring Wingfield Estate, drop by the new Railway Bar & Grill on nearby Wingfield Road for a delicious local lunch amid lush tropical landscaping and charming private dining pavilions. Enjoy a sun-kissed afternoon enjoying sunbathing, snorkeling or flyboarding on one of the popular beaches of South Friar’s, South Frigate or Cockleshell Beach. 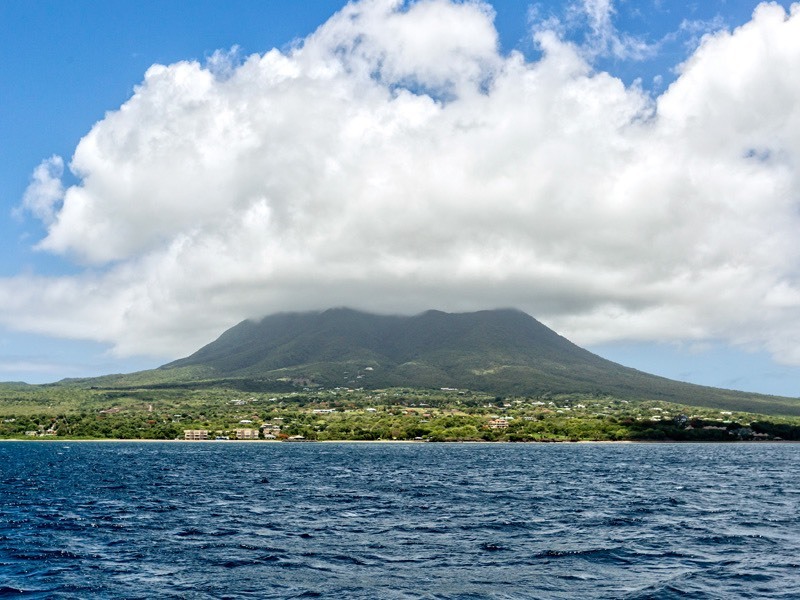 Depart on a day trip to Nevis, our sister island via ferry. 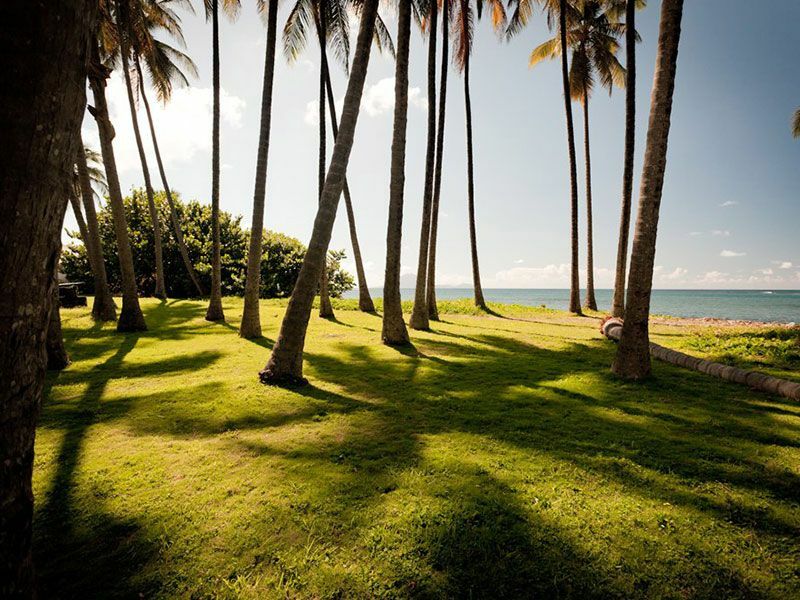 A tapestry of vivid green landscape, blue skies, and long, empty beaches, Nevis has an addictive slow pace of life that will entice you to slow down and relax. 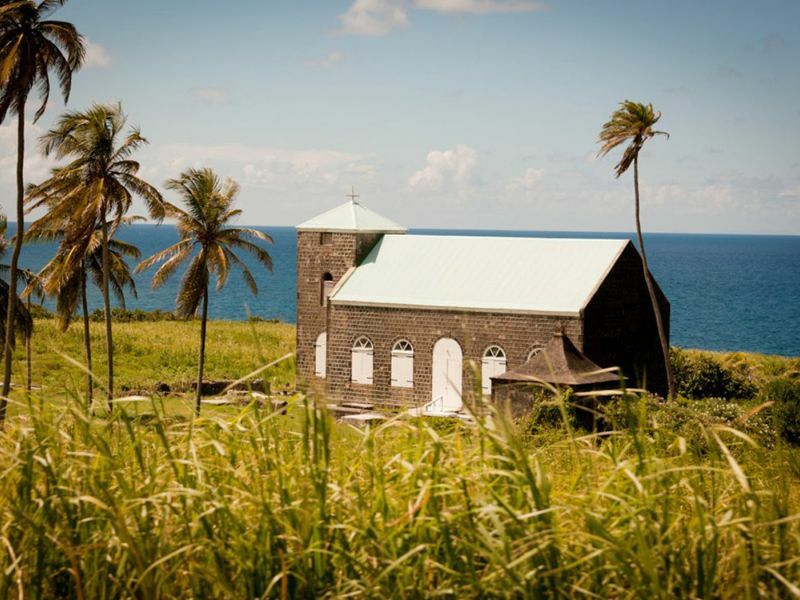 Spend the morning exploring the island’s proud history on the Heritage Trail by foot, car or bike; you’ll take in historic churches, picturesque sugar plantations, and plenty of goats and donkeys. Elegant Montpelier Plantation, with a 300-year-old sugar mill, is where British Naval hero Horatio Nelson married Frances Nisbet in 1787. Then find a spot on one of its glorious beaches to while away the afternoon. Pinney’s Beach is a local favourite, with its golden sands and turquoise surf; if you’re hungry (or thirsty), head to Sunshine’s beach bar (order the Sunshine Salad, “made with love,” and/or the Killer Bee cocktail). Sample sushi prepared from locally caught fish. Locals and visitors alike rave about Rituals Sushi; Ballahoo and Carambola offer fresh sushi as well. Enjoy an all-day sail and snorkel aboard a state-of-the-art catamaran. The tour includes snorkeling in a secluded cove teeming with rainbow fish, a buffet lunch, and a fully stocked bar. 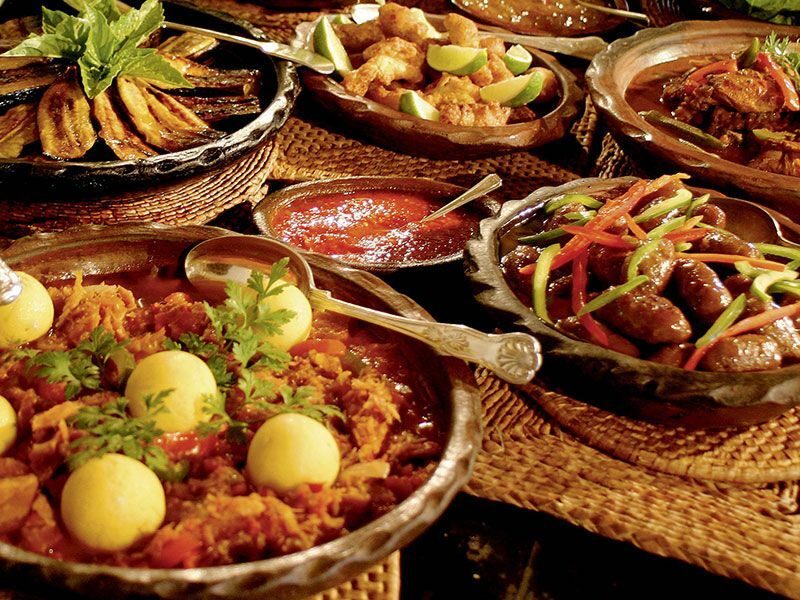 Keep it easy tonight—but no less scrumptious—at one of the island’s upmarket international restaurants. Feel like Italian, French, Japanese, Indian, or Asian? You’re in luck. 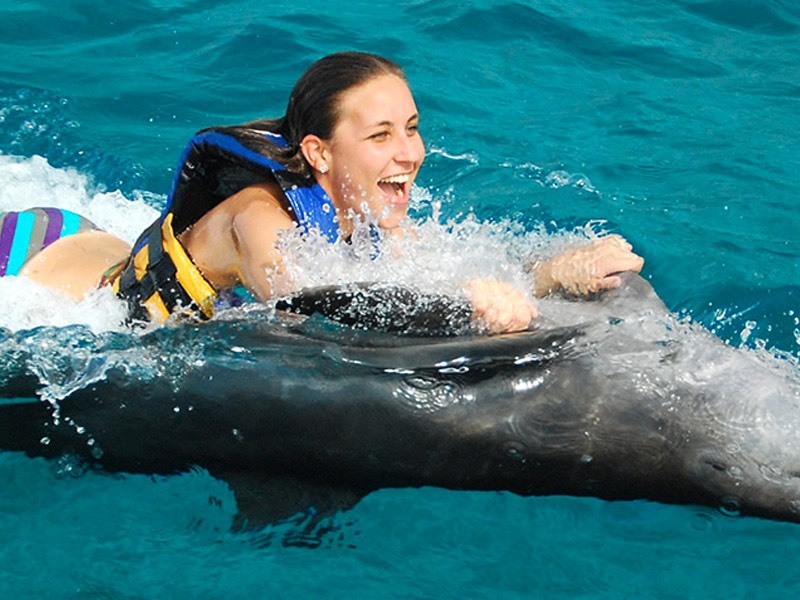 Swim with dolphins and feel their love in a once-in-a-lifetime experience at Discovery Cove. Eat like the locals from one of the many vendors at the local Food Court—offering the likes of barbecued meat, salt fish and Johnny cakes, black pudding, and goat water (spicy goat and breadfruit stew). Located next to the RAM’s Cash and Carry outlet in Bird Rock. Enjoy duty-free shopping at Port Zante, the cruise ship terminal just a few blocks from downtown Basseterre. 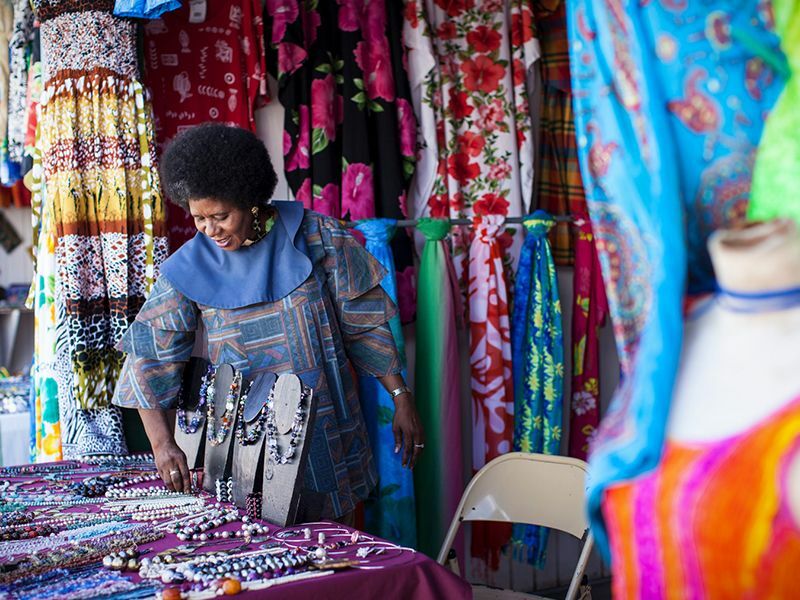 Or seek out Amina Craft Market, where dozens of artisans purvey local handicrafts, the perfect place to buy gifts and souvenirs for friends and family back home. ï¿½For the young and young at heart, tuck into fresh seafood and rum punch at The Strip in Frigate Bay. Then dance the night away to a live DJ or band at one of the beachside bars. 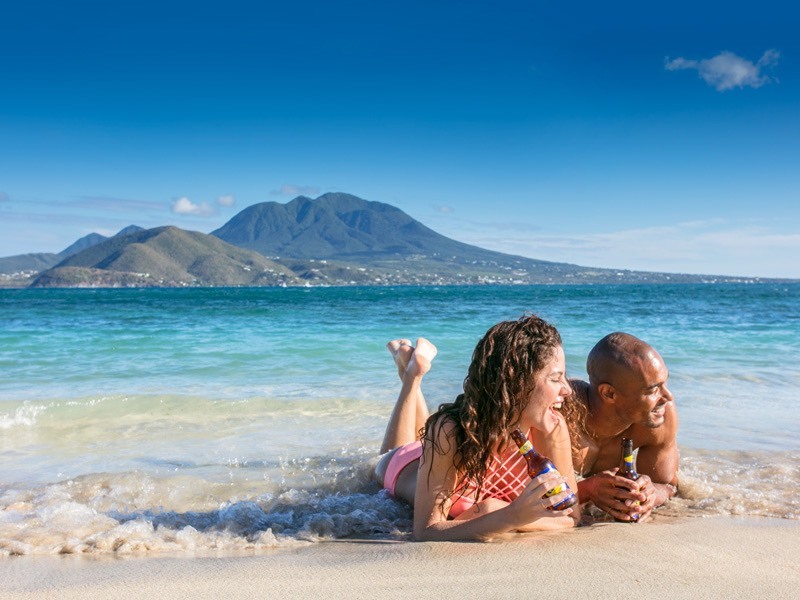 ï¿½Checkout of your hotel and say farewell to lovely St. Kitts … until we meet again! And one last bit of advice: Choose the fly in/out option through KayanJet; you’ll agree flying has never been so easy.